Sometimes I struggle with how to touch people deeply in my words, life, influence, and blog. I need you all to know, point blank, that my main goal in life and in my business is to make a difference by showing you who Jesus is and how he loves you. 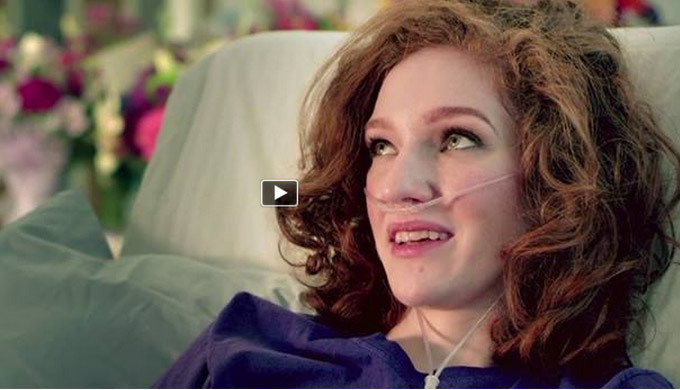 Katelyn James Alsop, owner of Katelyn James Photography, posted this inspiring and beautiful video to her blog today, hoping that more people would hear Abigail’s story and be affected by it. I’m so glad that she did. Each of you deserve to see the peace that can happen through a faith and relationship in Jesus Christ. And this is not just a peace that can come about through cancer or lying on your death bead, but a peace that can happen all throughout life. A peace that you can have and experience. Just by faith that Jesus came, died for your sins, and rose again, defeating death and giving you a relationship with God again. Just last night I laid down to go to sleep and said, “Man. I’m so glad that today is over.” After watching this, I sat here crying and feeling a conviction of wasting the days that I could have spent glorifying Christ that I do have left. And realized that the truth is, we are all on our death beds. We all have numbered days and hours left to our lives. Every day we are 24 hours closer to dying. It seems normal to ignore that fact, but if you live in that reality, how much more could you do to experience life to it’s fullest and it’s best? To actually live in light of eternity? I think it could change the world. I hope that this story touches you the way that it did me. As Katelyn said, I also believe that this video was meant to go viral. You have a platform of potentially thousands of people just through your Facebook friends! Just like I do. Even if you only have ten, share it. As it was meant to be shared.